Andrew’s brother Tyler has enjoyed a lot of my cooking and he has tasted some of the very best pizzas. For example, you may remember that he is the reason I finally caved and made the Macaroni and Cheese pizza. Tyler has spent many of his summer vacation days helping us move, unpack, and lay over one ton of stone pavers in the backyard. I would say he has been beyond generous for anyone, especially a 16 year old. The last time Tyler was over I let him peruse my list of pizzas I have not yet made. I gave him the honors of choosing one for me to make for him as a small thank you for helping us out so much. There was one I had been saving and thought he might select. And he did. He chose my pulled pork pizza recipe. I was very excited to attempt this pizza and make pulled pork for the first time. My mom shared her recipe for pulled pork, which included my Uncle Al’s BBQ sauce recipe. The pulled pork was surprisingly easy to make, however it did take a while to complete. I roasted the pork loin in Pepsi on Friday. Then I let it cool and soak up some juices over night. On Saturday morning while Andrew and Tyler were painting our garage, I made Uncle Al’s BBQ sauce, pulled the pork loin, then simmered it all in the crock pot for a while. 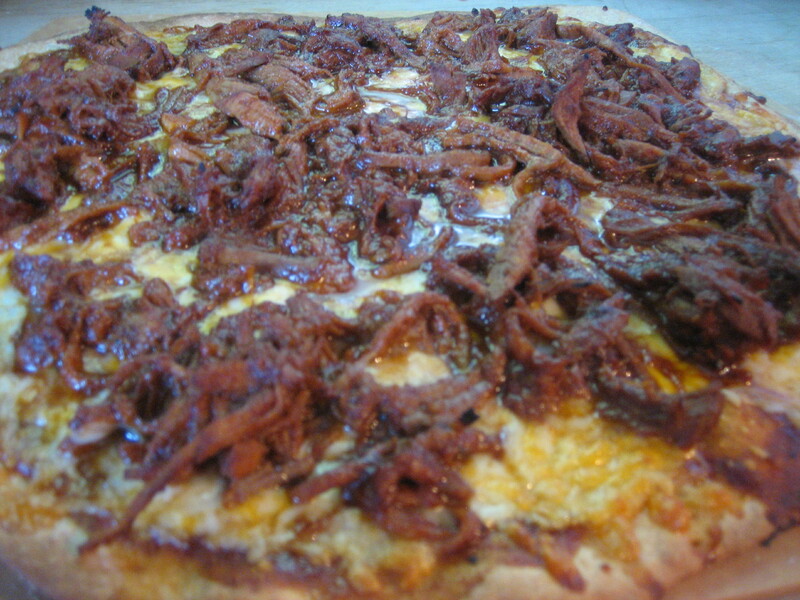 When the aroma was too irresistible I spread some BBQ sauce on the pizza dough, sprinkled on Colby jack cheese, then slapped down the pulled pork and let it bake. Andrew, Tyler and I stood anxiously awaiting the timer to go off and then dug in. Between Uncle Al’s BBQ sauce, the juiciness of the pork and the cheese I’m not even sure how to describe the deliciousness of this pizza. It was just fantastic. Tyler even thinks it topped my Macaroni and Cheese pizza!